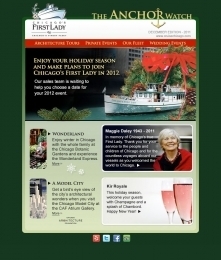 Enjoy the Holiday Season and make plans to join Chicago's First Lady in 2012; Chicago Botanic Garden Wonderland Express; In memory of Chicago's true First Lady, Maggie Daley; Chicago Model City at the CAF Atrium Gallery; Kir Royale. 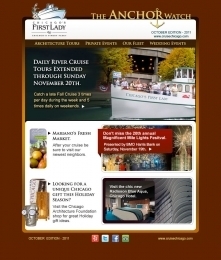 Daily River Cruise Tours Extended through Sunday November 20th; Mariano's Fresh Market; Don't miss the 20th annual Magnificent Mile Lights Fesitval; Looking for a unique Chicago gift this Holiday Season? ; Visit the chic new Radisson Blue Aqua, Chicago Hotel. 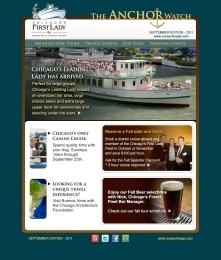 Chicago's Leading Lady Has Arrived; Chicago's Only Canine Cruise; Looking For A Unique Travel Experience? ; Reserve a Fall date and Save; Enjoy our Fall Beer selections with Nick, Chicago's Finest Fleet Bar Manager. 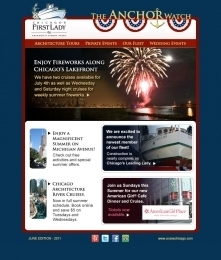 Enjoy Fireworks along Chicago's Lakefront; Enjoy a Magnificent Summer on Michigan Avenue! 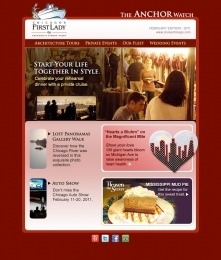 ; Construction is nearly complete on Chicago's Leading Lady; Save $5 on Tuesdays and Wednesdays; American Girl Cafe Dinner and Cruise. 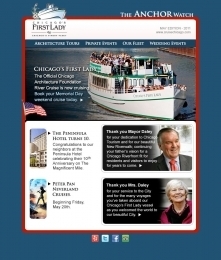 Book your Memorial Day weekend cruise today; The Peninsula Hotel turns 10; Thank you Mayor Daley; Peter Pan Neverland Cruises; Thank you Mrs. Maggie Daley. 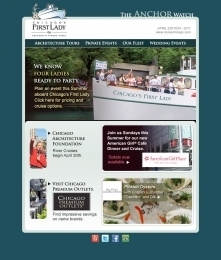 We Know Four Ladies Ready To Party; Chicago's Architecture Foundation River Cruises Begin April 30th; American Girl® Cafe Dinner and Cruise; Chicago Premium Outlets; Pickled Oysters. 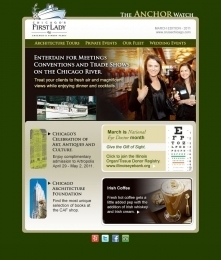 Entertaining for Meetings, Conventions and Trade Shows on the Chicago River; Chicago's Celebration of Art, Antiques and Culture; March is National Eye Doctor Month - Give the Gift of Sight; Chicago Architecture Foundation book store; Irish Coffee. Start Your Life Together in Style; Lost Panoramas Gallery Walk; Hearts a Bluhm on the Magnificent Mile; Chicago Auto Show 2011; Mississippi Mud Pie from Heaven on Seven.